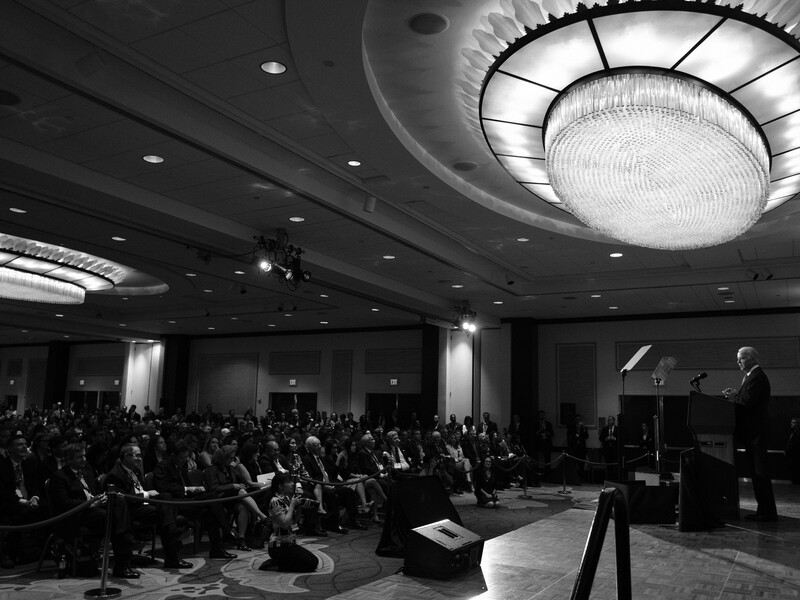 Vice President Biden delivered the keynote address at the Center for a New American Security annual conference in Washington, D.C. This is what he said. Ladies and gentlemen, in less than a decade CNAS has built something impressive. It’s growing stronger and it’s getting more influential year by year. And today I’m here to speak about a question that’s paramount in all of our minds, and that is: How should the next President handle the national security inheritance of the Obama administration that will be passed along in January? And I want to say at the outset, you’d expect me to be more optimistic than maybe others you’ll hear from or have heard from. But I am truly optimistic about America’s future. I think we’re better positioned than any nation in the world by a long shot — any region in the world — to be the dominant political, economic, and military force for the better part of this next century. And the choices the President and I have made over the past seven and a half years, they have been to quote the title of a book, very “Hard Choices,” choices that have required very difficult tradeoffs. We’ve positioned the United States at the forefront, though, I think of tremendous opportunity. This is one of the most informed audiences I could possibly be speaking to on this topic. But all has changed, changed utterly in the last 15 years. We’re presented with an entirely new deck of cards. Some of the old cards are still there that have enormous consequence. But there’s many new things. Failed states, a whole range of things you all have heard about and talked about. But I think with smart, sustained and steady American leadership, we can seize the opportunities that are existing and leave a more peaceful and more prosperous future to our children and grandchildren. And I really, truly believe that. But if we turn inward, if we undermine our most important relationships, or seek soundbite solutions to defined by complexity — issues defined by complexity; if we forget who we are; if we begin to betray our values and embrace intolerance; I think we’ll squander all of the hard-earned progress, and we’ll squander the opportunities that exist for us today. So today I’d like to take a little bit of time to describe to the world from where I sit 100 feet from the Oval Office and the stakes of the choices that lie ahead. Let me start by making a couple things clear. One, the world in which we live today is considerably more complex and interconnected than it was a quarter of a century ago when the Cold War ended, to state the obvious. It is arguably more complex than it was even 15 years ago after 9/11. But at the same time, despite the complexities and the proliferation of new challenges, by almost any measure, the United States is stronger and more secure today than when President Obama and I took office in — January 20, 2009. We steered the economy that was in collapse through an arduous recovery. And we’re poised to enter a period of significant resurgence. We’ve gone from crisis, to recovery, to on the verge of genuine resurgence if we seize the moment. We remain the world’s leading economic power, and we will for some time. The next President has a tremendous opportunity to finish what was started, to amp up our rate of economic growth, and bring economic resurgence home to Americans all across the nation. We know how to grow the economy. We’ve done it before. Invest in education, job training, infrastructure. It’s not magic. And there used to be bipartisan consensus on almost all of those things. Joe, did you ever think you’d see a day when Republicans opposed infrastructure modernization? We rank 27th in the world in transportation infrastructure. The United States of America! If you want to see the eighth wonder of the world, go down and see the two new locks of the Panama Canal. Yet there’s only three ports from the Gulf to Maine that can accommodate these new super Panamax ships. But a strong economy — I’ll never forget, I’ve been around so long, the first two years I served, Stuart Symington was still in the Senate. God, I’m getting old. But he had a refrain. He always talked about, our entire foreign policy rests on a strong, growing economy. It’s an obvious thing. A strong economy is the foundation of our unrivaled military, part of the layered defense we’ve built to keep America safe. And we are so tragically reminded again in Orlando where I visited last week of the dangers that exist. We have to remain vigilant against an increasing, diverse range of threats. Throughout our administration we’ve kept laser focus on homeland security. Our intelligence and law enforcement professionals are coordinating and sharing information at an unprecedented level. We’ve invested billions of dollars since 9/11. And everyone wondered whether or not we really had made the progress we say we have made. All you got to do is compare it to what it is in Europe now, and compare what they’re now beginning to grapple with. Our partners around the world are now sharing considerably more intelligence with us about the threats emanating from the region and from Europe; and coordinating all of us, in terms of things as basic as — I won’t go into the list in the interest of time — but just passenger records. Prior to Paris, we didn’t have access. But our greatest strength, ultimately, and I want to get back to this, is not just the example of our power, but the power of our example. Standing up for the values protects us better than any barrier we could build between ourselves and the rest of the world because our values are what draws the world to our side. And that’s vital. Because the unrivaled network of alliances and partnerships that we have enables us to be an effective global leader. But only if we act consistent with our values. As we continue to urge our allies to do more, denigrating our closest partners as liabilities is a serious and tragic mistake. The United States built the basic architecture of international order after the devastation of World War Two. And it has served us very, very well, and the world very well for the past seven decades. That’s why we’ve invested so much energy to defend and extend the international rules of the road. It matters. We’ve signed historic arms control and nonproliferation agreements. We’ve led worldwide efforts to lock down nuclear materials, expand trade, protect the environment. And because of the steps we’ve taken no country is better positioned to be followed — we just need to be followed by the rest of the world — than we are. Now, the next administration will make its own choices about how to wield American power, and how to direct our resources, but as I look forward to what they will inherit, I see three major areas that will define our engagement with the world in the coming decades. And that’s what I’d like to spend a few minutes talking about with you today. First, seizing the possibilities that exist on both sides of the Pacific. We are a Pacific power. I have spent more time I’m told than any world leader with President Xi. I’ve had over 25 hours in private dinners with him, just he and I, and an interpreter because of the arrangement that former President Hu and President Obama set up for us to get to know one another. I remember him asking me why we were doing what we were doing in the Pacific. I said, because we are Pacific power. We will remain a Pacific power. And I suggested that our being present was one of the reasons why they’ve been able to progress so much because of the stability that has been sustained as a consequence of our presence. But starting right here in the Western Hemisphere, for the first time in history, it’s possible — possible — to imagine a hemisphere that is middle class, democratic, and secure from the northern reaches of Canada to Chile’s southern tip. That’s why the President turned to me one day — as he often does — and said, Joe, you do the hemisphere. Like, okay, Mr. President. You think I’m joking? I’m not joking. You do the hemisphere. He said jokingly — he said, there’s not much of a time zone change. You can do it on the weekends, and you make friends easily. So just go. I hope he was kidding. But look, one of the reasons why we prioritize improving relationships with our neighbors, including the opening of Cuba, is our standing in the hemisphere has never been better. The quote I used when I first made a speech at the State Department with a lot of the hemispheric leaders there, I said, it’s no longer do we look at what we can do for you, it’s what we can do with you. It matters — to go back to the original thesis, it matters how you treat other nations, the respect your show or don’t show. Challenges surely remain. But today the reason is defined by opportunities — opportunities for greater trade and economic cooperation, especially with the open of the Panama Canal and the expansion; opportunities for greater energy integration, with the United States is exporting liquefied natural gas throughout the region and beyond. Opportunities to end the long-running conflicts in the civil war in Colombia. We also have a major new initiative in the Northern Triangle to deal with a whole range of problems, but also a whole range of opportunities. Imagine Central America, democratic and secure. Imagine what it will mean to the hemisphere if that is able to be accomplished. And we finally move beyond these stale ideological divides. The nations of our region are ready to work with us, as never before, to tackle shared challenges like stemming migration from Central America. The next administration should harness this momentum and build on it. But if we build walls and disrespect our neighbors, we’ll quickly see all this progress evaporated, replaced by a return of anti-Americanism, of coercion, rift throughout our hemisphere. The choices that make our region less democratic, less prosperous, and less secure actively undermine our American national interest. On the other side of the Pacific, we’ve recharged our engagement with Asia, the world’s most consequential region. The next administration is going to inherit treaty alliances with Australia, Japan, South Korea, the Philippines. And they’re stronger than they’ve ever been. Maintaining our alliances isn’t always easy, to state the obvious. But the United States is wealthier and safer because the world’s strongest democracies are in our corner. It’s just common sense. But we’ve also seized historic opportunities to build relationships beyond our traditional allies, fostering democratic transition in Burma, deepening our ties with Vietnam, managing relationships with Cuba [sic**], expanding our partnership with India, working with ASEAN to advance rules-based order. These relationships complement our alliances and further support economic, political, and military foundations of America’s Pacific — America being a Pacific power through the 21st century. As home of half the world’s population and many of the world’s fastest growing economies, we cannot afford to ignore the opportunities that exist in Asia. That’s something every single CEO in America knows. And that’s why securing a Trans-Pacific Partnership has been our top priority in this administration. It is as much a foreign policy initiative, as it is an economic initiative. We’re not there. China will fill the vacuum just by the sheer weight and size. And it will not be in our interest. And thanks to American leadership, the deal includes provisions that raise international standards for the protection workers, protection of workers’ rights, the environment, intellectual property. But to be frank, to be frank, this deal has a long way to go to get passed through the United States Congress. Because whether in trade, maritime security in the South China Sea, or nuclear non-proliferation in Northeast Asia, the United States has to lead by writing the rules of the road in this vital region. Otherwise we leave a vacuum that our competitors will rush to fill. That leads me to the second key point I’d like to make. The next President will have to manage complex relationships with regional powers, powers that have the capacity to contribute to the international order or to challenge it. Nowhere is this more pointed than in our relationship with China. As the world’s two largest economies, our fates are unavoidably intertwined. President Obama and I have made pragmatic choices that center our relationship with China in enhanced cooperation and responsible competition. We have found some common ground. We’ve made some historic progress to address global challenges like climate change, epidemics, development, non-proliferation. And we stand firm when we have real disagreements over issues like human rights, trade and investment, regional security. The next administration will also have to navigate the relationship with China marked at times by breakthrough cooperation and intense cooperation — competition. Sometimes, as with the mounting threat from North Korea, cooperation and competition with China will coexist. The notion that it will be all one or all the other is short-sighted and self-defeating. The same is true with regard to Russia where our approach is — if appropriately managed — will be marked by a complex mix of enhanced deterrence, strategic stability, and, yes, necessary cooperation. With our partners and allies, particularly in Europe, we’ve imposed real costs on Russia for its absolute outward aggression towards Ukraine. Russia must uphold its commitments under the Minsk agreement. There can be no backing away from that. And sanctions should remain until they do. We’re helping Ukraine implement vital economic reforms and root out corruption. It has not been easy. Corruption is endemic in all those former “Soviet states”. But by forcing them — forcing them? Coercing them — no, not coercing them, convincing them. In that order. It takes way a significant foreign policy weapon the Russians have used so well. Meanwhile, our moves to strengthen our European alliance and bolster NATO continue to provide a bulwark against further Russian aggression. For years, we’ve encouraged Europe to spend more on defense, diversify their sources and supplies of energy. And now we’re starting to see some progress on these fronts, and these efforts have to continue. But there’s a lot of work to do. Embracing Putin at a time of renewed Russian aggression I believe would call into question America’s longstanding commitment to Europe whole, free and at peace. But neither is it time to dust off the Cold War playbook. We’ll have to continue cooperating with Russia where our interests overlap. And as new military technologies arise — raise the stakes of miscalculation and escalation, we need channels with Moscow to clearly communicate our intentions. There’s an appealing moral clarity in grouping the world into friend and foe. But in reality, progress so often demands we work with those with whom we do not see eye-to-eye. That’s why we seized the possibility of moving beyond the decades of conflict in Iran to lock in a nuclear agreement. Iran is neither a friend nor a partner. But our willingness to engage to protect our interests, combined with international political and economic pressure on Tehran to negotiate, peacefully removed one of the greatest threats to global security: The threat of a nuclear-armed Iran. The deal speaks for itself. It’s working. Iran is complying. Its nuclear program has been substantially rolled back. Inspectors are on the ground. We’re not home yet, but so far. Tearing that agreement up now would only leave Iran’s nuclear program unconstrained, increase the threats to Israel and our partners in the Gulf, and turn the international community against the United States, and sharply increase the prospects of another major war in the Middle East. The nuclear deal was never meant to resolve all of our problems with Tehran. At the same time, it has opened other opportunities for engagement on narrow issues where our interests align. Engaging Iran is neither incompatible with, nor at the expense of, America’s ironclad commitments to our allies and partners in the Middle East, including Israel. And we continue to counter Iran’s destabilizing activities in the region. And we will. We have all the authorities necessary to hold Iran to account. Our targeted sanctions against their ballistic missile program, their support of terrorism, their human rights violations remain firmly in place. The past seven-an-a-half years have shown time and time again that a forward-leaning engagement with the world pays huge dividends. This brings me to the third and final point I’d like to make: The imperative for the next President to deal with complex transnational threats — because in our hyper-connected world, events anywhere can impact everywhere. Environmental disruptions, pathogens, computer viruses, malicious ideologies — these threats don’t respect borders. And no matter what others may claim, we cannot wall ourselves off from these challenges. Even in simpler times, isolationism never offered more than a false sense of security. True security reminds us to grapple with and requires us to grapple with globalization and an interdependent world to find common solutions that span borders. That’s what we did when we rallied the world to address Ebola — the Ebola epidemic in West Africa last year. We rejected hysterical calls for quarantines and travel bans and built our response instead around hard facts and science. We drew on all our strengths, from our military, to our health and developmental professionals. With tireless diplomacy, we brought the world along with us. And we saved hundreds of thousands of lives. We took a similar approach toward climate change, harnessing science, technology, and relentless diplomacy to forge the Paris agreement. And in the process, we created an historic opportunity to head off a truly existential danger — an opportunity to head it off. and bold initiatives like Power Africa abroad. And we’ve demonstrated American leadership can bring our allies together with emerging powers like China, India, and Brazil to protect our planet. But these opportunities can only be seized if the next President follows the science, recognizes the danger of doing nothing, and musters the political will to address the threats. Terrorism and violent extremism are yet another example of the virulent transnational dangers that requires sustained global response. Al-Qaeda, ISIL, other offshoots, they’re real threats. The horrific events in Orlando, the attacks in San Bernardino, Paris, Brussels, and elsewhere remind us — including in Turkey — remind us over and over again that terrorism can happen anywhere and does happen anywhere. At the same time, these terrorists cannot destroy the United States. They cannot bring down our civilization. We should never underestimate America’s strength or dismiss the inherent resilience of the American people. President Obama has never hesitated to use force to defend the American people when necessary. Just ask Osama Bin Laden and al-Qaeda’s top operatives in Afghanistan and Pakistan. Or the leaders of al-Qaeda affiliates in Yemen and Somalia. Or more than 120 ISIL top leaders and commanders. Terrorism must — and will — be defeated. But our campaign against violent extremism must be smart and has to remain consistent with American values. The use of force should be precise and proportional. There must be a clear mission that advances U.S. interests. And whenever possible, we should act alongside allies and partners to share the burden and invest the international community in success. And the results have to be sustainable. Lasting victory against al-Qaeda and ISIL requires viable, local forces to hold liberated areas, rebuild shattered communities, and govern effectively. That’s why we’ve worked with more than three dozen nations to support and train Afghan forces and to hunt down al-Qaeda and other terrorist groups in their sanctuaries. That’s what we will continue to do so. That’s why we’ve partnered with African nations, from Nigeria to Somalia to Tunisia, to go after al-Qaeda and ISIL affiliates. In Iraq and Syria, we’ve built a 66-nation coalition to train local forces. And we’ve carried out more than 13,000 airstrikes. We’ve provided afflicted communities with billions in humanitarian and reconstruction assistance. And our active diplomacy continues to encourage inclusive governance in Iraq and to try to identify a path to deescalate the war in Syria. The results? Well, we’re winning and ISIL is losing. Over the past two years ISIL has lost 47 percent of the territory it once held in Iraq and more than 20 percent in Syria. We’ve taken out thousands of frontline fighters in the battlefield. Foreign fighter flow is down 50 percent. They’ve lost millions in revenue. But to be sure, ISIL is resilient and barbaric, fueled by a bitter ideology of destruction. Even as they retreat from territory in Iraq and Syria, we’ll have to keep pressuring on them in Libya and elsewhere, and take the fight to them in cyberspace. Permanently defeating this scourge will likely take years. And it will absolutely require us to keep the world on our side. Parenthetically, I’d note that not but two years ago, we were talking about the establishment of a caliphate that they were well on their way of doing, how that was going to bring down Saudi Arabia, Jordan, bringing chaos to the Middle East beyond what exists now. The caliphate is not a reality. And the thought of it being a reality is being crushed. But they still can do damage — just like al Qaeda without having large swaths of territory is able to do serious damage. But adopting the tactics of our enemies, using torture, threatening to kill innocent family members, indiscriminately bombing civilian populations, that not only violates our values, it’s deeply, deeply damaging to our security. There are 1.4 billion Muslims in the world. Some of the rhetoric I’m hearing sounds designed to radicalize all 1.4 billion. How do we win this? How do we win this long-term fight without embracing and engaging and having allies in the Islamic community in the United States, among American citizens and emigres? How do we do this without allies in the Muslim world among Shiites and Sunnis? Wielding the politics of fear and intolerance, like the proposal to ban Muslims from entering the United States, profiling Muslim Americans, slandering entire religious communities as complicit in terrorism, calls into question America’s status as the greatest democracy in the history of the world. And in the process, alienating 1.5 million [sic***] Muslims — the vast, vast majority of whom, at home and abroad, are peace-loving, doesn’t make the situation better. It makes it worse. And it plays into the very narrative of the extremists. How can it be said much clearer? ISIL wants to manufacture a clash of civilizations. They want Americans to view things in terms of us versus them. Why in God’s name are we giving them what they want? And besides, we’re so much better than that. So let me conclude with what I said at the outset. Despite the many challenges ahead, we have more opportunities than ever before. I’ve never been more optimistic about America’s capacity to lead the world to a more prosperous and peaceful future. But our leadership does not spring from some inherent American magic. It never has. We’ve earned it — over and over again — through hard work, discipline, good judgement. It stems from our willingness to see challenges on the horizon and step forward first to meet them. There’s that old expression that Tom Friedman used. He said, if you don’t visit the bad neighborhood, it will eventually visit you. From our ability to lead by example and draw partners to our side, that’s what has always been America’s greatest capability. Not empty bluster. Not a sense of entitlement that fundamentally disrespects our partners. Not an attitude, an insecurity of a bully. The United States cannot afford to draw back from our responsibilities now. There is simply too much at stake. We need a President who can unite the Western Hemisphere and work like hell trying; continue to build our alliances and partnerships in Asia; manage extremely complex relationships with China, Russia, and Iran; and lead the world to address transnational challenges, including the persistent threat of terrorism. I believe this is one of five times in American history we find ourselves at an inflection point. The choices we make today will steer the future of our world for the next three decades. In this moment of uncertainty, the world desperately needs steady American leadership more than ever before. Because when America leads, the way that only we can, guided by principle, grounded in our conviction that America does best when we make sure everyone does better, no nation can match us. And one concluding point. The dysfunction in Washington is not only crippling in terms of everything from the Supreme Court to moving from recovery to resurgence. In the 42 years I’ve been engaged in the conduct of foreign policy, I’ve never seen it have as much negative impact on our ability to conduct our foreign policy. Many of you here are extremely sophisticated and travel the world and have deep understandings of other parts of the world. I get sent by the President — I’ve traveled over 1.2 million miles just since being Vice President. When I’m sent, it’s usually because everybody knows whatever I say is it — because they know I speak for the President. There is never any question. And I mean never. And so on the assignments I’ve been given over the last seven years, when I get sent to meet with a head of state, trying to convince them of a particular position, if we reach agreement, I literally — and Joe is with me a lot, and I’ve been with Joe a lot — I reach across the table and shake hands. And here’s the response I get the last four years that I never ever, ever got before. They grab my hand and say, but, Mr. Vice President, can you deliver? Let me say it again: Can you deliver? Because every single time friend, foe, or agnostic with whom we deal, when you make a deal, it requires them to take a chance. Translated into everyday English from Wilmington, Delaware, as, look, don’t ask me to walk out on this limb and take a political hit — even in a dictatorship — unless you assure me. I don’t doubt you. I don’t doubt the President. But can you get it done in Washington? They understand our systems much better than Americans understand theirs. So, folks, my hope is that not only will this presidential election be behind us, but that we will begin — because I think the vast majority of Republicans up on the Hill, as well as Democrats know this is not the way to do business. They know it. Joe, I spoke with 17 Republican senators just on the Supreme Court. All 17 say, Joe, I know you’re right. But don’t ask me to move yet, Joe. This will happen to me. The American public is sick and tired of the dysfunction. The instinct is to throw all the rascals out. But I’m convinced that we are in a domestic inflection point, too; that my colleagues are beginning to listen more closely to the pattern of the cadence of the political process out there. So my hope is these next four years will be much better positioned with a President who understands and Congress that can vehemently disagree, but ultimately concludes there has to be compromise. If that occurs, and it will occur, it may not occur in the next two years, but it will occur, there is not a single thing that we can’t do as a country. I thank you all for being so gracious and listening, and I really — there’s so much talent out here, I just — if you’re ever going to be involved, man, this is the moment. This is the moment.